Samos is a mountainous island in the SE part of the Aegean Sea off the coast of Asia Minor. It is 27 miles long (E-W) and about 14 miles wide. The island is separated from the mainland by a strait of one mile. 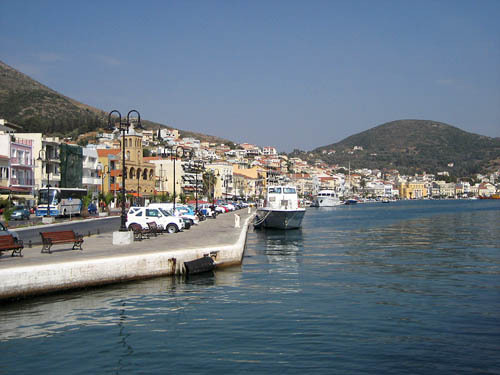 The port of Samos on the island of Samos. Photo by Ferrell Jenkins. Paul and his companions stopped at, or passed near, Samos on the return from his third journey. English versions do not make it clear whether Paul stopped at Samos or came within sight of the island. These comments by Floyd Filson might be helpful. 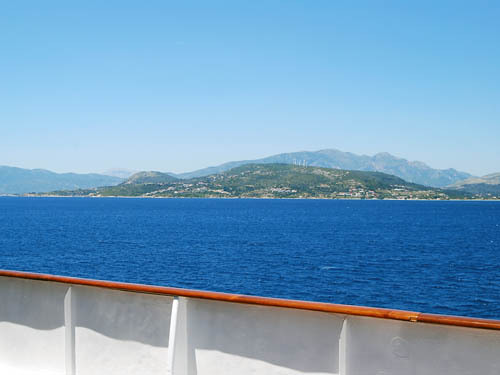 Here is a view of the eastern end of Samos as a ship passes through the most narrow part of the strait between the island and the Turkish mainland. Samos from a ship in the strait between island & mainland. Photo: F. Jenkins. Paul may not have visited Samos, but it is clear that he came very close. This entry was posted in Bible Study, Greece, New Testament, Travel, Turkey and tagged Aegean Sea, Apostle Paul, Samos. Bookmark the permalink.